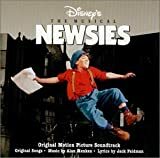 Accueil Bande originale Paroles Chansons High Times, Hard Times – Paroles de la chanson dans “Newsies”. High Times, Hard Times – Paroles de la chanson dans “Newsies”. Interprétée par Ann-Margret et les crieurs. Sometimes the living is sweet. And sometimes there’s nothing to eat. So when there’s dry times. I wait for high times and then. My good friend the mayor, he called me today. HE SAID, Medda, the voters are turning away. Help me, he cried, or they’ll give me the axe. I said, Your Honor, you’ve got to relax. So your old lady don’t love you no more. So you’re afraid there’s a wolf at your door. So you got street rats that scream in your ear. You win some, you lose some, my dear. Oh, high times, hard times. But I always lands on my feet. I put on my best. Ah yes, and I stick out my chest.